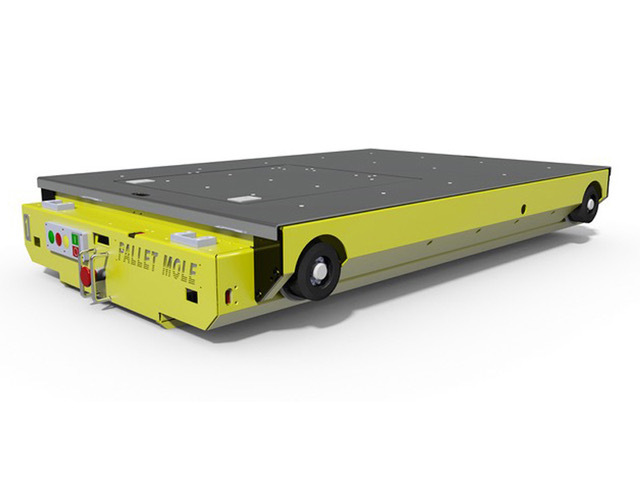 Powered by on-board rechargeable batteries, the Pallet Mole™ is driven on rails, into a specially designed pallet racking system of tunnels. Using the lifting platform and positioning sensors, each load is then transported to the furthest available storage location in the tunnel. Pallet storage and retrieval are both conveniently operated by the forklift truck driver using a remote control. It is not necessary for a forklift to enter the racking system in order to retrieve a pallet. A Pallet Mole™ rack structure is far more stable than traditional Drive-In systems. The mole system is supported at each level, whereas the Drive-In system is only supported across the top of the structure, making it extremely vulnerable to collapse should a single upright be damaged in any way. Using a mole to retrieve a pallet completely eliminates the risk of a forklift driver damaging the racking while driving inside the system. No human can repeat the same movement over and over again without the possibility of a mistake. 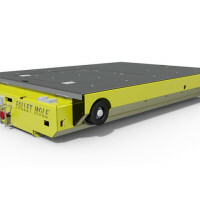 The mole removes ANY risk of mistakes inside the rack structure, therefore eliminating the possibility of any damage to pallets or racking while performing a deposit or retrieval movement. The mole can move many more times faster and with 100% accuracy than any forklift driver, no matter what the driver’s skill level. The mole system can be uplifted and repositioned in any new warehouse, as well as be extended vertically, should the need arise. 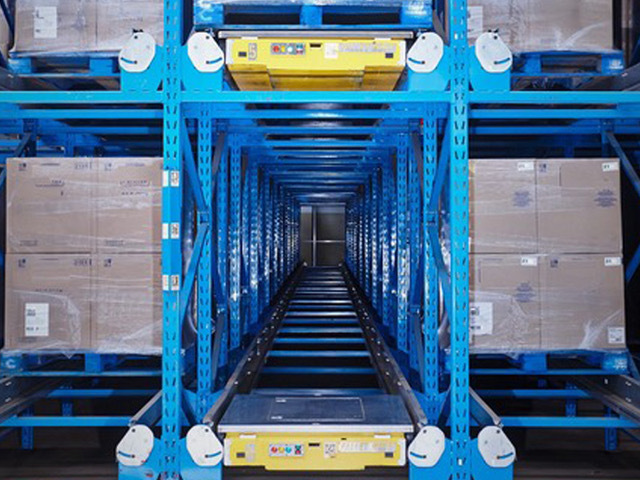 The Pallet Mole™ counts the number of pallets in each lane for stock taking purposes, and shuffles pallets to the front of the rack removing whatever is being issued from any given lane. The mole is supplied with a charging station, and can “rest” in the station when not in use – only applicable to the fully automated system. The batteries are changed manually. 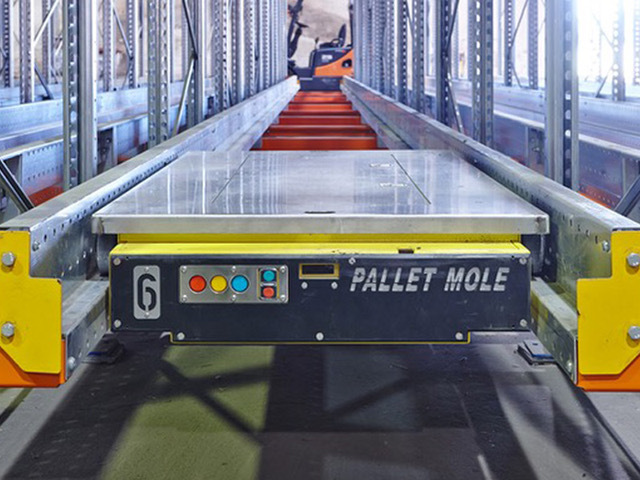 The mole is easily transferred from one lane to the next, as easily as moving a pallet into or out of the rack. FIFO can be achieved with this rack proposal, as there is sufficient room for an aisle either end of the rack. Automatic Pallet Mole™, 1160 mm long by 880 mm wide fitted with 4 off, 100 mm diameter Nyl-o-tron wheels. Lift is provided by a suitably rated 3-phase electric motor operating via worm gears and eccentric cams. Long Travel is provided by a suitably rated 3-phase electric motor driving two wheels by means of chain drive. Auto Retrieve – When operating in this mode the Pallet Mole™ will immediately return and collect a second pallet and then wait in line for the first pallet to be removed by the Fork Lift Truck. Auto Deposit – When operating in this mode, a single instruction will enable the Pallet Mole™ to automatically and continuously Deposit pallets presented in the pick face for storage. 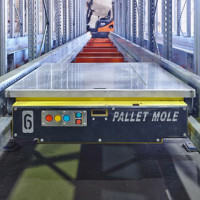 Auto Retrieve by Quantity – When operating in this mode the Pallet Mole™ will Retrieve the number of pallets asked for in the beginning of the sequence. 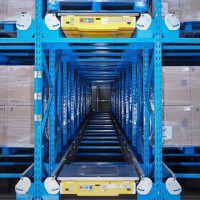 Shuffle – This format allows the pallets to be moved in sequence to the offloading face in a FIFO and LIFO operation and where a number of pallets have been removed from the off-load face. Patented Pallet Count Function – This function will count the number of pallets in any lane and report the information to the hand-held controller. This feature greatly reduces the time normally associated with end-of-month stock-taking. Mole Removal – When operating in this mode the operator allows the Pallet Mole™ to be removed from the lane by moving all the way forward in the lane. 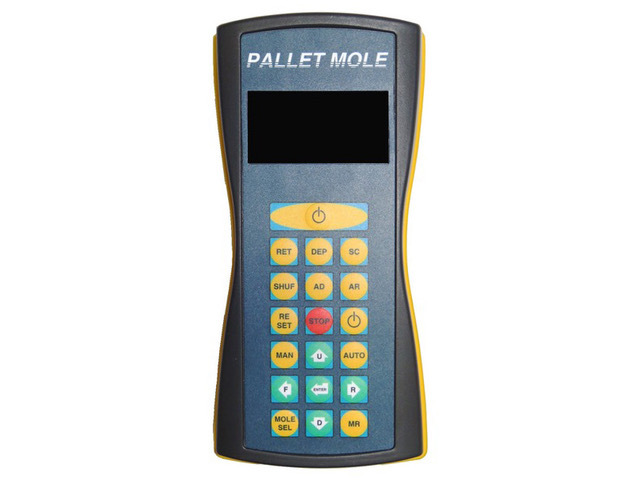 Manual Operation – This function gives the operator the freedom to operate the Pallet Mole™ in manual when something is wrong or servicing needs to be performed. Teach Operation – This function allows the operator to teach the Pallet Mole™ when first used. 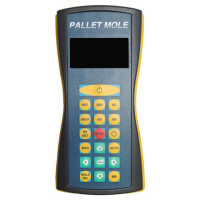 “Battery Low Fail Safe” Function – The Pallet Mole™ monitors the battery charge level. On low level the Pallet Mole™ will execute the last command and return Home giving a “Charge” indication. The unit will not perform another operation until it has been charged. Each Pallet Mole™ is supplied complete with 1 of quick changeable “Lead-Acid Technology” battery pack and suitable charger. The battery pack is designed to operate within an AMBIENT environment for 8 Hours and in a FREEZER environment 4 Hours. (Additional stand-by batteries can be supplied to allow for 24 hr. operations). Alternatively, Lithium battery pack is also available as an optional extra, which will allow for an 8 Hour operation in a Freezer environment. The Pallet Mole™ requires no holes in rails to ensure operation. All positioning is done on-board of the unit. Each lane should however be provided with physical end stops to prevent accidental dislodging of the units.